Pattis’ new book, “Taking Back the Courts: What We Can Do to Reclaim Our Sovereignty,” is an angry appraisal of our “failing” court system. “I believe the courts belong to the people but that judges, prosecutors and defense lawyers are taking the courts away,” Pattis writes in the opening chapter. “Do you care enough to demand change?” he asks the reader. His hair tied back in a ponytail, Pattis is a combative figure as he strides into New Haven Superior Court and other legal venues. “I am the last friend of the friendless, a warrior for the despised, a thorn in the side of the popular and powerful,” he writes. 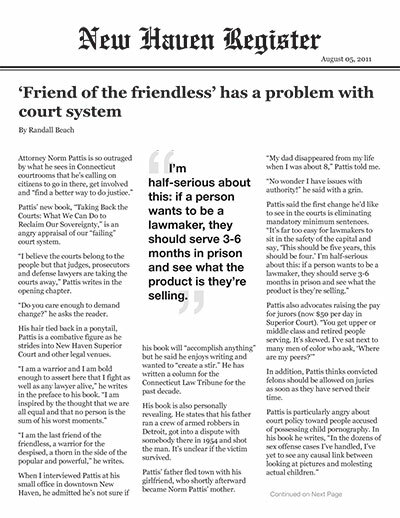 When I interviewed Pattis at his small office in downtown New Haven, he admitted he’s not sure if his book will “accomplish anything” but he said he enjoys writing and wanted to “create a stir.” He has written a column for the Connecticut Law Tribune for the past decade. His book is also personally revealing. He states that his father ran a crew of armed robbers in Detroit, got into a dispute with somebody there in 1954 and shot the man. It’s unclear if the victim survived. Pattis’ father fled town with his girlfriend, who shortly afterward became Norm Pattis’ mother. “My dad disappeared from my life when I was about 8,” Pattis told me. “No wonder I have issues with authority!” he said with a grin. In addition, Pattis thinks convicted felons should be allowed on juries as soon as they have served their time. Pattis knows he isn’t making any friends in the courthouses with his attacks on judges for “intellectual cowardice,” prosecutors who he says are given too much power, and “unaccountable” police officers.